Make the most out of what you already have in the home to curb your toddler's (and your) boredom. Raid the kitchen cabinets and the recycling bin to repurpose everyday items into toys. Get a breath of fresh air, and don't forget about letting your toddler "help" around the house with cleaning and cooking tasks. Boredom spells disaster when you're the mom of a toddler—especially when you work from home. So what do you do when your little one is tired of all the usual toys and on the brink of an epic temper tantrum and you just desperately need a break? It's time to get creative and mix things up. Here are eight ideas to chase away the boredom with your toddler (and they're pretty fun for you, too). Toys don't exactly have to be toys. Create instruments from things you have around the house—the best places to raid are the recycling bin and the kitchen cupboards. Fill up a box or milk jug with dried beans or rice for a shaker. Test out boxes, bottles and pans to see what makes the best drum (or combine them for a whole drum set). Remember when you (or grandma) ordered something for your toddler and he or she played with the box instead? Don't get rid of those boxes. When boredom hits, bring them out again. Color on them, turn big ones into a playhouse, or pretend they are rocket ships. The contents of the recycling bin make some great activities for little kids. Use plastic bottles as pins and you have a quick, inexpensive new game. Dig out the Crayons, the Play-Doh, the macaroni and glue. It doesn't matter if you don't make anything Pinterest worthy; what matters is having fun with your little one. Keep a box full of craft items that are appropriate for your child's age. 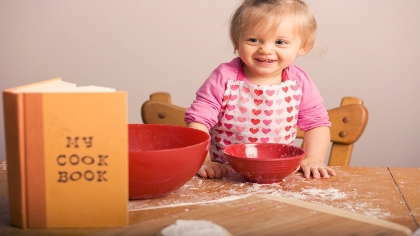 Baking can be fun for toddlers—even if they're only old enough to just “help” dump the ingredients into the bowl. For older toddlers, use the experience to teach them things like counting. Toys that are always available and always played with lose their luster. Keep some toys put away to bring out when boredom strikes. You can also create day-of-the-week bins—fill seven bins with different toys and activities and label them for a different day. Having them put away for the rest of the week makes them a little more exciting. Toddlers love to feel like they're big kids and helping mom out is no exception. Sweep the kitchen and let them play with the mop. Let them “dust” while you vacuum. (Okay, so this one isn't exactly fun for moms, but it does keep little ones entertained). If you work from a desk, some exercise is a good way to break up your day and it can keep your little one entertained, too. Roll a ball back and forth or play basketball with a laundry basket. Put in a kid-friendly CD and dance. Go for a walk around the block. Head outside and play tag. Staying home all day makes it tough to keep little ones entertained, but all you need is something different to bust the boredom.